The Samsung 355V5C is the latest mid range laptop from Samsung, offering an AMD processor and 6GB of Ram, all running on the new Microsoft Windows 8 operating system. This 15.6" notebook features the A6 4400M 2.7GHz Processor as well a substantial amount of storage in the form of a 500GB hard drive, integrated graphics card and DVD drive. We look in closer detail at the 355V5C in our review - read on for more. 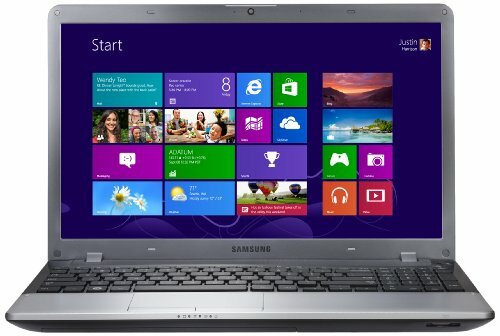 Below is our review of the Samsung 355V5C, a 15.6" laptop, featuring 6GB RAM, 500GB hard drive and Windows 8. This 15.6" display laptop from Samsung is their latest offering in the sub £400 category, offering on first glance a decent specification at a fairly competitive price. The AMD processor fitted is the A6 4400M model operating at 2.7GHz, which in turn is backed up with a rather substantial 6GB of RAM, a 500GB hard drive and Windows 8 Operating system. Weighing around 2.5kg, this Samsung notebook measures a total of 24.3m by 37.3cm by 3.3 cm - and as such is not the thinnest or lightest laptop out there - however it does offer a pretty decent specification, and is firmly priced in the lower end of the laptop market, and so we can't mark them down too much for this. The AMD 2.7GHz processor and the 6GB of RAM keep the laptop running fast - it handled multiple applications without fuss, and operated at a decent speed - overall we were happy with this aspect of the notebook. In terms of storage you are presented with a 500GB hard drive, which should be ample space for the majority of users. This hard disk operates at the standard 5400rpm, and offered speedy access when both reading and writing. The 15.6" display provided clear viewing, with it's standard 1366 by 768 pixels resolution - overall our testers were impressed with the screen, with colours appearing rich and vibrant. The interior of the laptop is finish in silver and black, with a full width keyboard complete with a number pad to the right hand side. The touch pad, situated slightly towards the left hand side of the notebook, provided a decent level of control over proceedings, and felt accurate and easy to use. In terms of connections you are provided with numerous options - 2 x USB 3.0, 2 x USB 2.0, headphone and microphone jacks, HDMI, Ethernet, 3 in 1 card reader, VGA and DVI. Overall we were impressed with the Samsung 355V5C, it ran Windows 8 smoothly, and at a good speed. The audio quality from the speakers wasn't bad either, on par with the majority of laptops in this price bracket. And so, onto the Pros and Cons. Cons: Slightly heavy - asides from that, we liked this laptop. A decent entry level laptop - if you're looking to buy a notebook for less than £400, then the Samsung 355V5C is worth a second look.